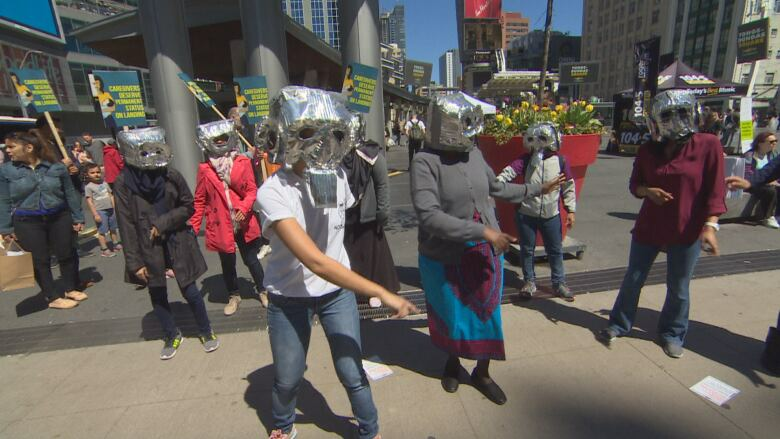 Migrant caregivers wore robot masks and held up signs that read #notarobot at Yonge-Dundas Square on Sunday to call on the government to give them permanent residency. The Mother's Day protest demanded that caregivers be treated as human with full rights and advocated for similar treatment for members of their immediate family. 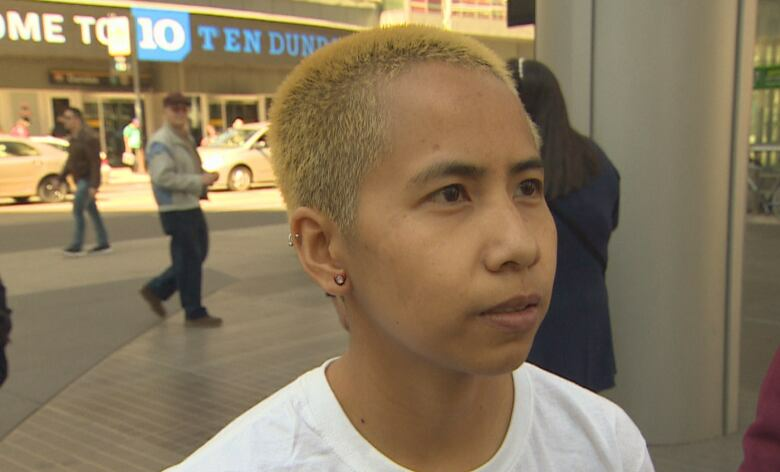 Kara Manso took part in Sunday's demonstration and came to Canada as a caregiver from the Philippines in 2012. She says families have been separated as a result of not having permanent residency. "A lot of caregivers are also mothers, and they are away from their families. They are taking care of families here in Canada, taking care of children, taking care of elderly to make sure that the mothers in the Canadian family can go to work," Manso told CBC Toronto. "They can't take care of their own families because they've been separated for years, and that's why we are calling on the government to give us permanent residency upon arrival and to have their families with them when they get here." Events similar to the one at Yonge-Dundas Square were also held in Edmonton and Vancouver, and caregiver organizations across the country are calling for steps to be taken to address the needs of those workers already in Canada and the caregivers that will continue to arrive until a new federal program for caregivers is in place. 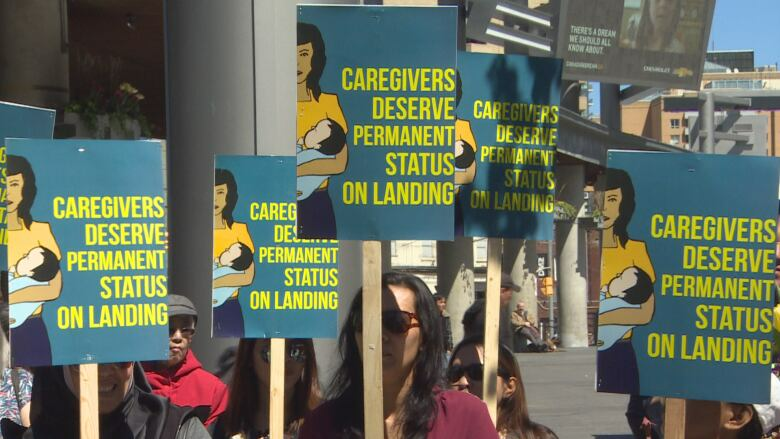 In addition to open work permits, careworkers are demanding the removal of the requirement of a one-year Canadian post-secondary education, removal of the English language test prior to permanent residency and removal of caps that allow only 2,750 permanent resident applications each year in each caregiving stream. Manso, who worked for four years as a caregiver and serves as an organizer of Caregivers Action Centre, says the current structure of the caregiver program does not assure a path to permanent status. "A lot of caregivers who are in the program can't even apply for permanent residency. They are not eligible because they need one-year post-secondary Canadian education, [and] they need to pass a language test that has a high benchmark," she said. "So, all the little details for the new caregiver program does not allow any caregiver to easily get to permanent residency." Maria Mercado who came to Canada as a live-in caregiver in February 2015 said she was fired after only eight weeks because she asked her employer about overtime pay. "She made me work 60 hours or more every single week, and every single week she paid me for 44 hours," Mercado told CBC Toronto. "One day she asked me to work on a weekend and I just decided to ask her how much it's going to be . . . she fired me [and] told me that she need someone who is willing to work more hours and for free." Mercado said she was forced to spend the next eight months in a shelter. She was also unable to find a new job because her work permit was employer specific. With the help of Caregivers Action Centre, she was able to get the matter to arbitration. A hearing is now set for July 10. Anna Malla, an organizer with Caregivers Action Centre, said caregivers have been asking to be united with their families since the '70s. "They are actually asking to be able to come here from day one with their families with permanent residency status and to be able to have their rights respected as workers," she told CBC Toronto. "Essentially, the option already exists for the vast majority of migrant workers. In the Federal Skilled Workers Program, for example, people are able to come with their families, so that's just what we're asking for — to recognize that care work is valuable work. It's skilled work and that these workers should be able to come here as well with their families."